Modern apartment buildings are more complicated than ever. All the mechanical systems need to run properly. To help future building personnel understand each of their systems a set of orientation videos were made. 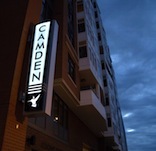 The subject is a 13-story residential apartment building in the Noma section of Washington DC built by Camden Development. There were 19 systems in all from HVAC and backup generators to trash compactors and sprinkler systems. Each had their contractor explain how each is setup and maintained. Additional graphics were created that locate each system on a building drawing. These are hosted on the company’s internal website.